Administrative division of regions of Ukraine is not homogeneous, but it is standardized. There are three types of regional subdivisions: raion, raion within city, and city of regional significance (jurisdiction). Not all regions have each type of those subdivisions. The most inconsistent type of division is raion within city. 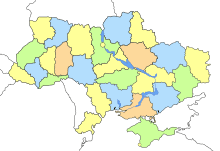 Each of those subdivisions are governed by their own district state administration chairman appointed by the President of Ukraine on the recommendation of a governor (chairman of the Regional State Administration). The legislative state power is electable and consists of a district council which is headed by a mayor in cities and a chairman in other settlements. Each regional subdivision is subdivided into smaller territories governed by local settlements' council (rada) and are named after them. "Regions of Ukraine and their composition". Verkhovna Rada of Ukraine (in Ukrainian). Retrieved 25 December 2011.